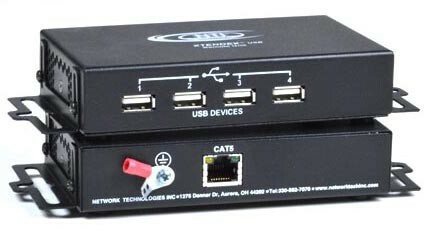 Also known as: USB extender, USB CAT5 UTP cable extension, USB booster, USB peripheral extender, USB active extension cable, extend USB device 200 feet via CAT5/5e/6/7 network cable, 4-port USB hub extender system, USB balun, USB range extender. Optional industrial USB extender for high temperature environments. This industrial system has the ability to operate and monitor in harsh environments at high temperatures up to 158°F (70°C). USB-C5-200: 32 to 100°F (0 to 38°C). USB-C5-200-IND: 32 to 158°F (0 to 70°C). USB-C5-200: -20 to 140°F (-30 to 60°C). USB-C5-200-IND: -20 to 158°F (-30 to 70°C). One-meter male USB Type A to male USB Type B interface cable included. Use CAT5/5e/6/7 UTP straight through cable for TIA/EIA-568B wiring terminated with standard RJ45 connectors (not included). "We're using the USB-C5-200-IND in our production machines and our engineers love them. We took advantage of NTI's 30 day no charge evaluation program, which allowed us to try them in our own environment. From there, we have placed several orders."